Today Sharon has this lovely den/livingroom picture to inspire us to use yellow and grey with white or ivory. As soon as I saw the picture I knew I'd be using my couch stamps from PTI. I used the Traffic Jam Embossing Folder to create the look of the cupboards in the background and Basic Grey Archaic for the rug! As you can see - I get very literal when using an inspiration picture! This is my last week as Guest Designer for Stamp Simply - time sure does fly when you're having fun!!! Thank you so much Sharon for inviting me to share with all of you this month! Check the wonderfully talented Stamp Simply Challenge Designers to see how they used these colors today! 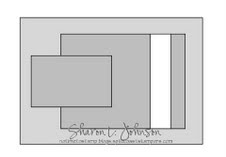 Today's Stamp Simply Challenge is to make a card using the sketch Sharon created below. Here's the card I made for the challenge. 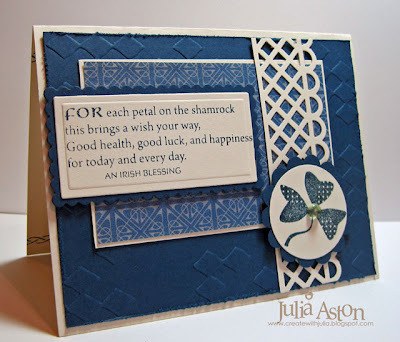 The stamps are Waltzingmouse - Irish Blessings and Celtic Heritage. I embossed the first panel with Diamonds in the Rough Cuttlebug folder. The lacey strip is a Martha Stewart punch. The DP strip is a piece of digital designer paper from WMS called Celtic Squares. I thought this would make a good masculine birthday card with the blue color and minimal frills! Here's what I stamped on the inside of my card today. Please check out the talented Stamp Simply Challenge Designers to see how they used this fun sketch! Accessories: Long rectangle & scalloped rectangle nestabilities, diamonds in the rough Cuttlebug embossing folder, distresser, Martha Stewart Lacey punch, dew drop, glue dot. 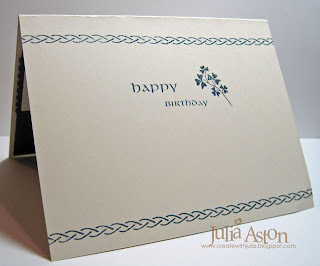 Friday Stamp Simply Challenge - Give it a Chance! Welcome to my 2nd posting as the June Guest Designer for the Friday Stamp Simply Challenges!! This weeks challenge is to use those unfinished pieces you created and then didn't use for some reason. We all have baskets or drawers or just plain piles of these little half finished projects don't we?!? The pieces I had already made and put aside and used today are the die cut stamped heart and the die cut blue felt flower. The stamps on this card are all by Waltzingmouse - the heart is from Seasons of Love and the sentiment is from Celtic Heritage. Check the wonderfully talented Stamp Simply Challenge Designers to see how they used their unfinished pieces. 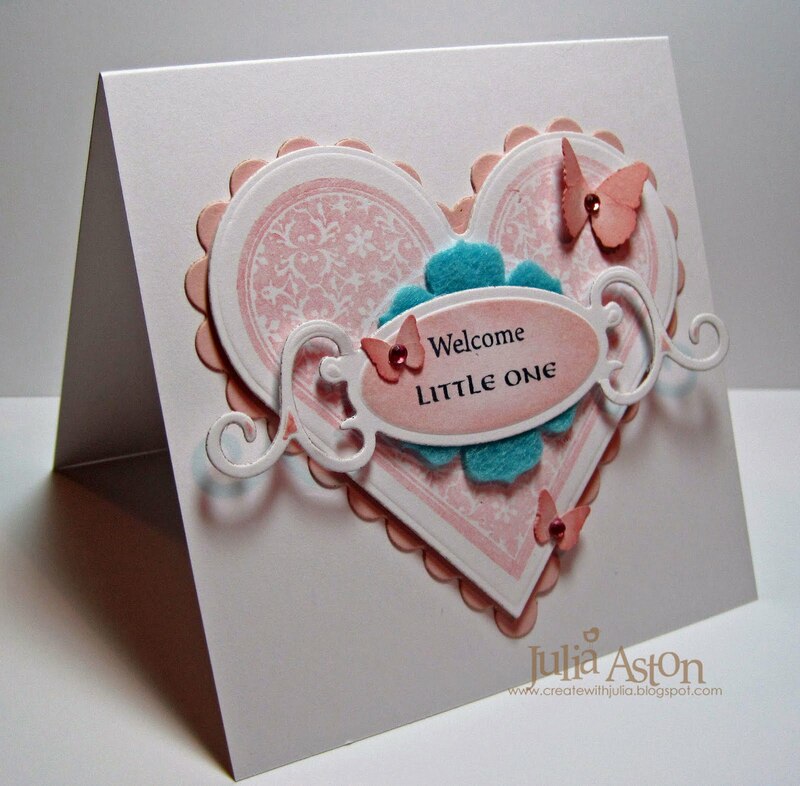 Friday Stamp Simply Challenge - Sweet Stuff! I am SO excited to be joining Sharon and her talented team as the June Guest Designer for the Friday Stamp Simply Challenges!! Yikes - how fun is this!?!?! 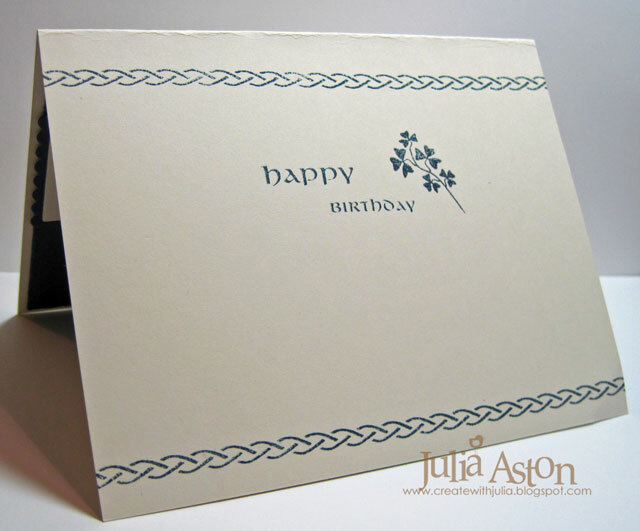 My stamping style tends towards the simple - so these challenges are perfect for me! This weeks challenge is from Jenny Gropp and she wants us to create a card or project featuring something sweet - a stamp image, paper or an embellishment. For my card I used one of the girl gingerbread cookie stamps and circle sentiments from the Oven Fresh set by Waltzingmouse Stamps. The beautiful ribbon is from Sharon's own Stamp Simply Ribbon Store. Won't you please join along in the Stamp Simply Challenge with us this week! You can play anytime, as many times as you want! If you upload your creation to Splitcoaststampers, please use keyword, ssnotime142. And don't forget to upload over on Sharon's Mr Linky! Julia Aston (me!) 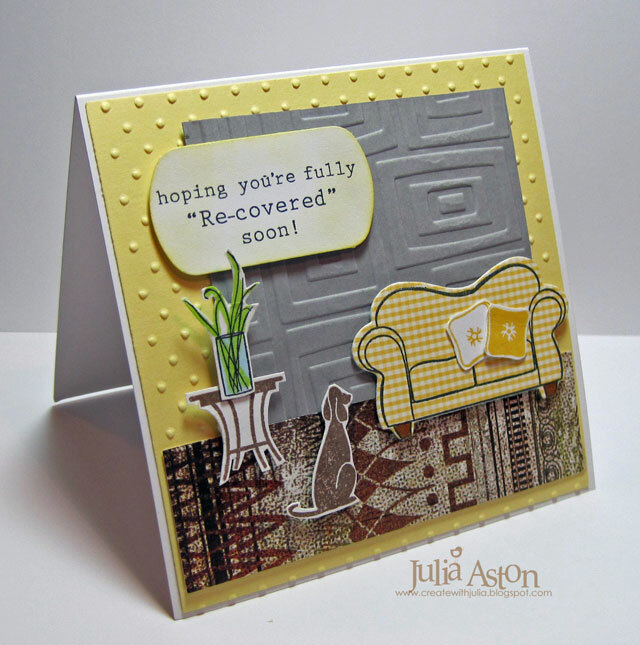 : Create with Me - June GUEST DESIGNER - whooo hooo!!! ETA: Check out Claire's Blog to see the winners on the WMS DT blog waltz and be sure to check her blog and back here on Saturday for some exciting news!!! Accessories: Ribbon - The Stamp Simply Ribbon Store, Circle & scalloped circle Nestabilities, Edge Punch - SU, foam dimensionals.